When you are visiting Punta Gorda you will surely want to go around the region in comfort. When you are new to the region, it is best that you have a chauffeured vehicle to take you all around. For a group of people traveling to a region for a holiday, it is more enjoyable when you opt for one of our charter bus rental Punta Gorda services. Reserve your charter bus now 813-514-6980. We have several charter bus vehicles out of which 20 passenger mini bus models can be taken up. Again, the category of 30 passenger shuttle bus models will allow one to choose as per the seating capacity and traveling requirements. For small distances transfers the mini buses that we provide through our bus charter service would be convenient and cost effective. For transferring corporate clientele in relative comfort, opt for the luxury coaches which we provide through our charter bus rental service. Call with any questions you may have 813-514-6980! There are several requirements of our charter bus service. 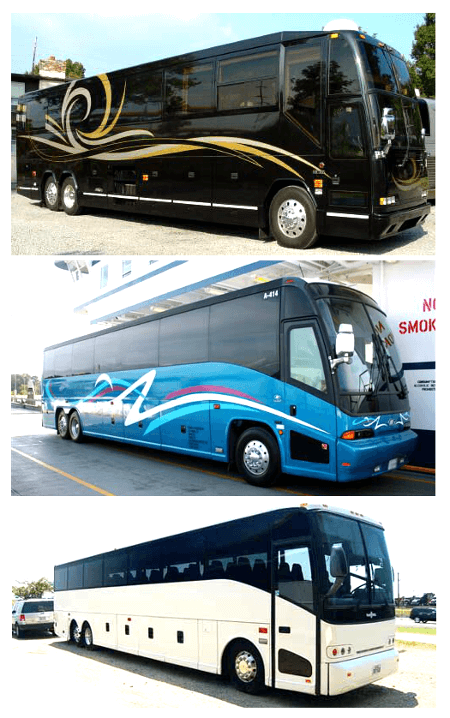 You might take a look at the 40 passenger charter bus models that we offer and make a booking online. When you click on a coach model, you will get to see the image of the coach, the seating arrangement and the rates applicable. For bulk booking you can avail of discounted rates. Once you have made a payment online, your booking is confirmed. You could also opt for our bus service by calling at the call center numbers provided. If you are entertaining guests, and want to kick things into gear, try our new Party Bus rental in Punta Gorda! Muscle Car City Museum; this is a unique museum to visit which specializes in cars. Fishermen’s Village; it is a local market place that is great for shopping. Military Heritage Museum; this is an educational museum to visit in this region. Octagon Wildlife Sanctuary; this is a natural and wildlife area to check out. Gilchrist Park; you will find the park area entertaining with live music sessions. These are some of the fun things to do and experience when you are in Punta Gorda. Among the 50 passenger charter bus models we offer, the airport shuttle services are popular. The nearby Southwest Florida airport and reaching hotels from the area become convenient when there are fixed shuttle services for pickup and drop at appointed times. Alternatively, you can book our limousine service in Punta Gorda. The neighboring cities and towns around Punta Gorda like Englewood, Cape Coral, Boca Grande, Cypress Lake, Iona, Port Charlotte, North Port, South Venice, Fort Myers, Laurel usually sees travelers and visitors going to and fro for long road trips. In order to travel in comfort when traveling long distance, it would be wise to opt for the charter bus service.